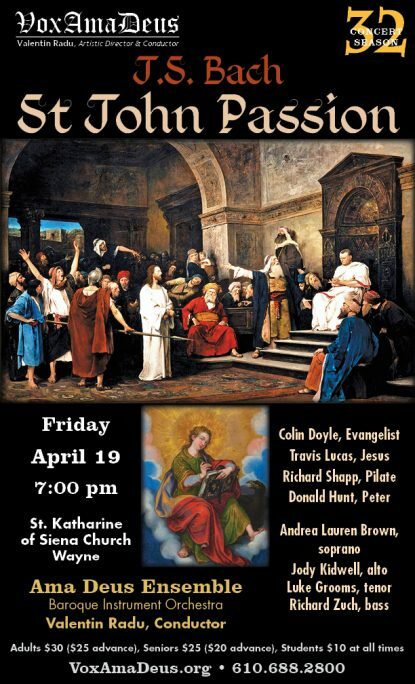 The Ama Deus Ensemble Baroque Orchestra, Choir and Soloists, led by Valentin Radu, perform Bach’s masterpiece, the Passion According to John, on Good Friday, April 19, 2019. First performed on Good Friday 1724, Bach’s St. John Passion is the older and the more intensely dramatic of his two extant Passions. Musically thrilling and spiritually profound, this work narrates the Passion of Christ as told in the Gospel of John, the Passion traditionally read on good Friday. Like the St. Matthew Passion, this choral masterpiece is a towering attestation of faith–an inspiring work for this sacred day. Tickets $10-$30, available online, by phone, or at the door.